The Axiomtek’s eBOX800-900-FL Embedded System is offered in IP67-rated extruded aluminum and heavy-duty steel case. The system comes with NVIDIA Jetson™ TX2 module, M12 type I/O connectors and four N-jack waterproof antenna openings. The product can be operated in -30°C to +60°C temperature range with 100 to 240 VAC power input and 10kV surge protection. The unit features a PCI Express Mini Card slot for 3G/4G/LTE/GPRS connections and is suitable for AI edge computing in intelligent traffic applications. Axiomtek - a world-renowned leader relentlessly devoted in the research, development and manufacture of series of innovative and reliable industrial computer products of high efficiency – is pleased to announce its last Artificial Intelligence (AI) embedded system, the eBOX800-900-FL. It adopts a full IP67-rated extruded aluminum and heavy-duty steel case for dust protection and water resistance. Moreover, the AI embedded system comes with a wide operating temperature range of -30°C to 60°C (-22°F to +140°F) and a vibration endurance for up to 3Grms. The embedded system is powered by the NVIDIA Jetson™ TX2 module which has a powerful 64-bit ARM A57 processor and 256-core NVIDIA® Pascal GPU. It features M12 type I/O connectors and four N-jack waterproof antenna openings for operational stability in rugged environments. The eBOX800-900-FL is ideal for AI edge computing and deep learning applications, such as smart city, smart manufacturing, smart transportation, and much more. The eBOX800-900-FL has 8GB of LPDDR4 memory and 32GB eMMC onboard. It comes with a wide range of 100 to 240 VAC power input with 10kV surge protection. The rugged edge computer also features one M.2 SSD PCIe 2.0 x4 socket which supports high-performance NVM Express interface for extensive storage needs. Furthermore, the embedded box PC is equipped with a PoE port to support the applications that require the use of IP cameras or any PoE device, i.e., traffic flow monitoring, license plate recognition, vehicle recognition, machine vision. "We are proud of producing the eBOX800-900-FL with high AI computing performance. 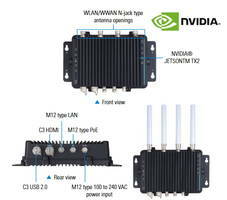 The intelligent embedded system is based on the high-efficiency, low-power NVIDIA Jetson™ TX2 module. With its rugged IP67-rated housing, M12 type I/O options, wide operating temperatures and wide voltage AC input with 10kV surge protection, this fanless edged system is designed for severe applications in outdoor environments," said Annie Fu, a product manager of Product PM Division at Axiomtek. "For instant, when it comes to traffic management, a high performance system which can accurately detect, record, process, and transmit huge streams of data is an indispensable tool for an intelligent traffic system. The Axiomtek eBOX800-900-FL with rugged design and versatility is ideal for AI edge computing in intelligent traffic applications." The eBOX800-900-FL is a high performance AI embedded system that supports one C3 USB 2.0 port, one M12 X-coded Gigabit LAN port, one M12 X-coded Gigabit PoE port, and one C3 HDMI port supporting full HD. Its four N-jack type antenna connectors feature a water-proof design for WLAN and WWAN usage. It has a PCI Express Mini Card slot for 3G/4G/LTE/GPRS connections. There are flexible mounting options including wall mount and VESA mount for this rugged box. It has passed the strict certification with CE and FCC Class A. Axiomtek’s eBOX800-900-FL is available from now. For more product information or pricing, please visit our global website at www.axiomtek.com or contact one of our sales representatives at info@axiomtek.com.tw.